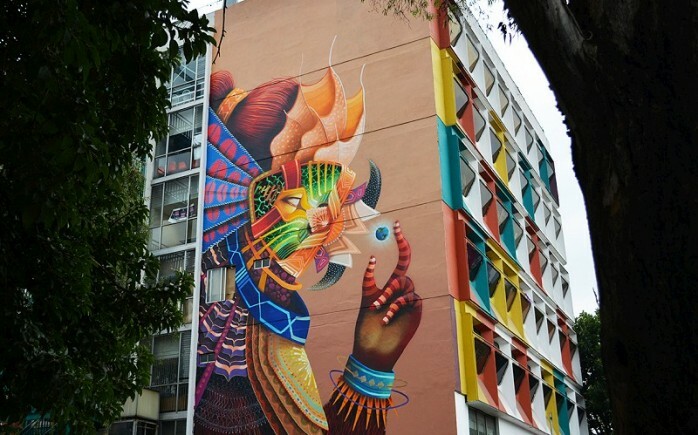 Curiot recently took part in a new mural project Lienzo Capital in Mexico City. Organized by Museo del Juguete and Insituto de la Juiventud, this project kicked off with the Mexican artist painting a big wall entitled Quetzen-tul con una canica más. Created on the side of a very colorful building with his recognizable imagery influenced by the mysticism of the ancient cultures, the idea of the piece reminds us how small and fragile human life really is, and how impossible it is for humans to control everything. The piece was painted with the imagery animals, hybrid beings with human elements, all merged with natural and traditional textures, patterns and elements that his work is known for. Every month, a new mural will created by Mexican artists for this project. Curiot also busy in his studio creating works for a big group show by Circle Culture Gallery in Berlin, as well as a two person show at Thinkspace in LA opening mid December.